Asian elements and influences became incredibly important for Porter and me as we conceptualized the naturalist's pied-à-terre in the Dakota. The walls of the main room were evocative of old Chinese scrolls and we saw the objects (like our beloved taxidermy scarlet ibis) we placed in front of it like three-dimensional watercolors come to life. We used two large Chinese silk panels with birds and flowers to flank the arched window of the master bedroom, a Chinoiserie stand from the 1970s covered minimalist cranes, and countless small tchotchkes. 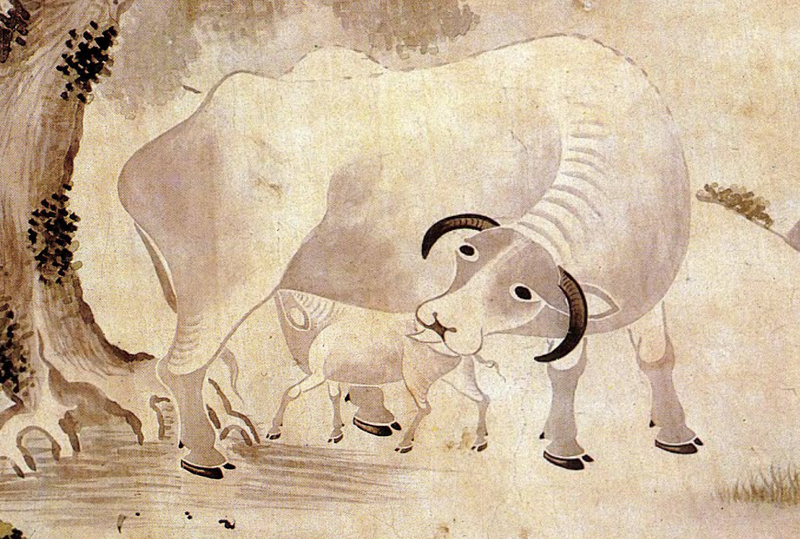 For our research, we poured over the collections of Korea's museums featured on the Google Art Project and unearthed heaps of incredible naturalist art, as expected. But even more exciting are the mind-blowing translucent garb and headgear from the 19th and 19th centuries. Here are a few examples of brilliant gossamer beauty and craftsmanship (sprinkled amongst comparative art we love) that are crying out to be mimicked in modern haute couture (particularly that Heukrip). (The descriptions are copied verbatim from the museum's information on Google Art Project since those curators know 100% more than I). 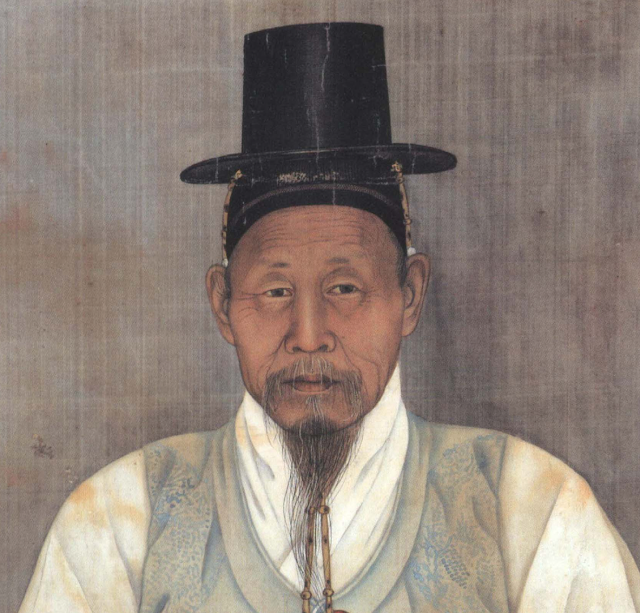 The black hat is worn by adult men after the Clothing Regulation Reform published during the reign of King Gojong (1864-1907). 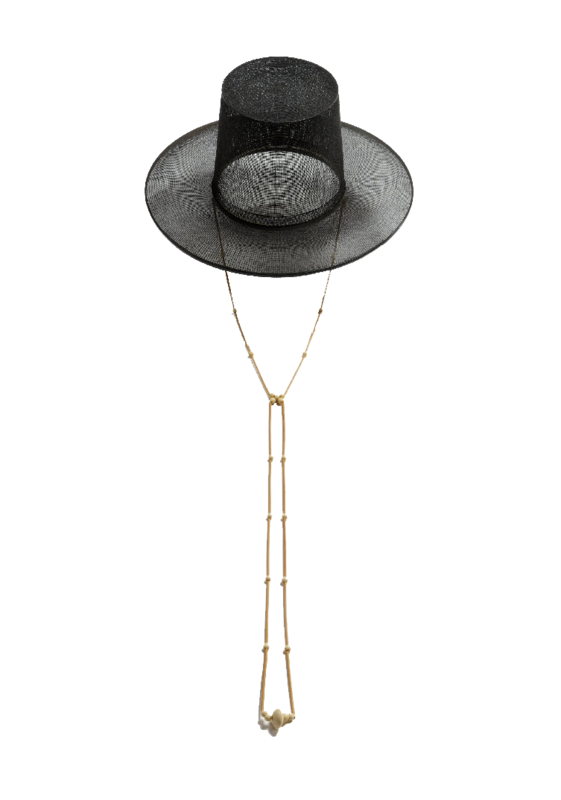 The hat is a complete set of hat, string, hook, Yeong and ties and it is for the nobility. The decorative string is constructed with 18 bamboo beads and 18 transparent amber beads, and a hexagonal ring in the middle. Unlike Choi Buk's landscape paintings that depict his character, this shows he was also good at painting animals that required detailed descriptions. 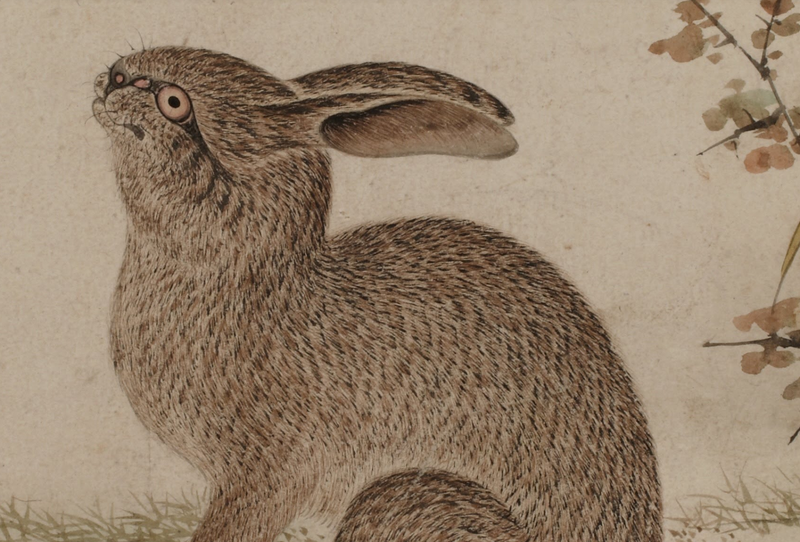 The feature of the rabbit, which stopped moving, contains a calm atmosphere with a simple background. In the description of the background, these paintings feature a damp atmosphere, which is a characteristic feature found in Choi Buk’s landscape paintings. These paintings demonstrates his elaborate description skill in expressing an object. Heuksamo is one of coronet worn with the civil and military officials' robes for working. Heuksamo is made of black Mora(silk), and two single layered wings are attached horizontally in the rear—this indicates the wearer was the 4th to 9th rank government officials. Gyupsamo is a similar coronet, made with same material, however it has two double layered wings attached horizontally in the rear; this was worn by 1st to 3rd rank government officials. It is a painting of Taejo’s ancestors’ tombs in Northern Hamgyeong province. Only 6 pieces of pictures are found today. Each picture indicates 24 bearings, and writes on the top right the name and location of the tomb, the title of the ancestors’ who were honored as a king, the name of his queen and numbers of children. 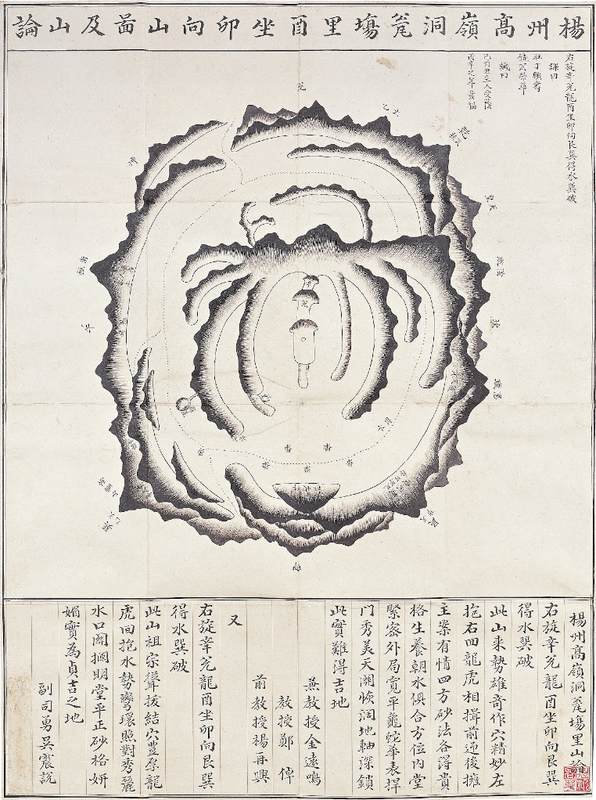 The picture clearly shows Feng-sui features; mountain ranges and topography is emphasized and composed to look as if the ranges are spread out from the center, and the center is described to show vital force of the earth. This picture seems to have been repainted every time there was a change to the tombs or the surrounding buildings. 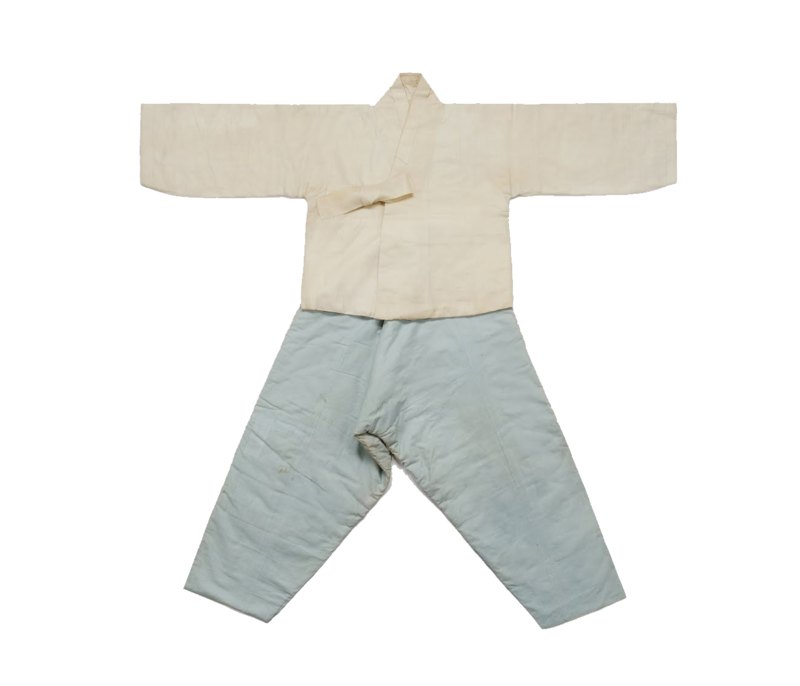 Baji and Jeogori (pants and top) from the time of the enlightenment. Jeogori is made of silk and Baji is made of cotton, but both are heavily padded with batting for the winter. 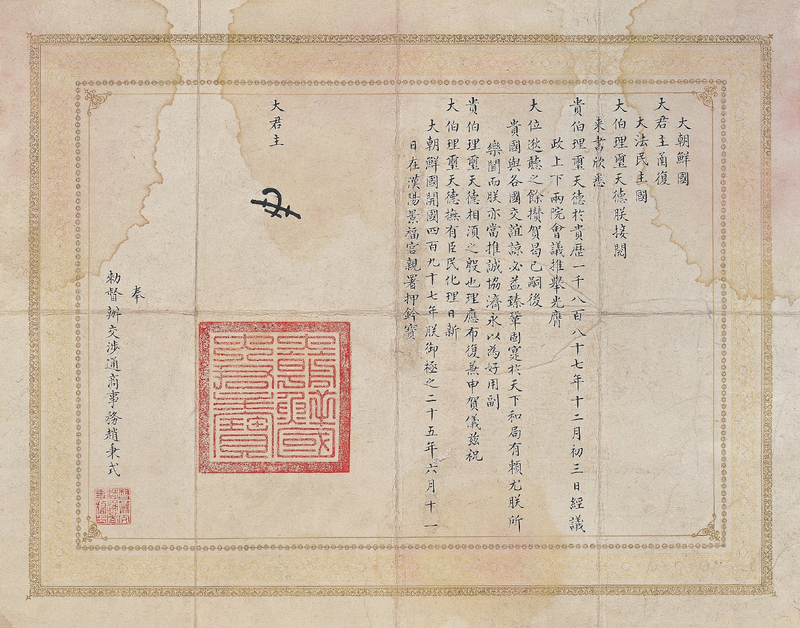 It was Gojong’s diplomatic letter (June 1888, year 25 of Gojong) to congratulate on the inauguration of French president (3 December 1887). King’s diplomatic letters in Joseon period were mainly sent to neighboring countries like Japan or Jurchens, but after a reform in Gabo year, the diplomatic letter included King’s own letter and treaties sent to the western world. This is part of the letter that was sent to the French president on 3rd December 1887 to congratulate him on being a head of a state. At that time, the French president was Sadi Camot. “Baeklisehcheondeok’ in the letter is a Korean writing of Chinese sound of the word “President”. 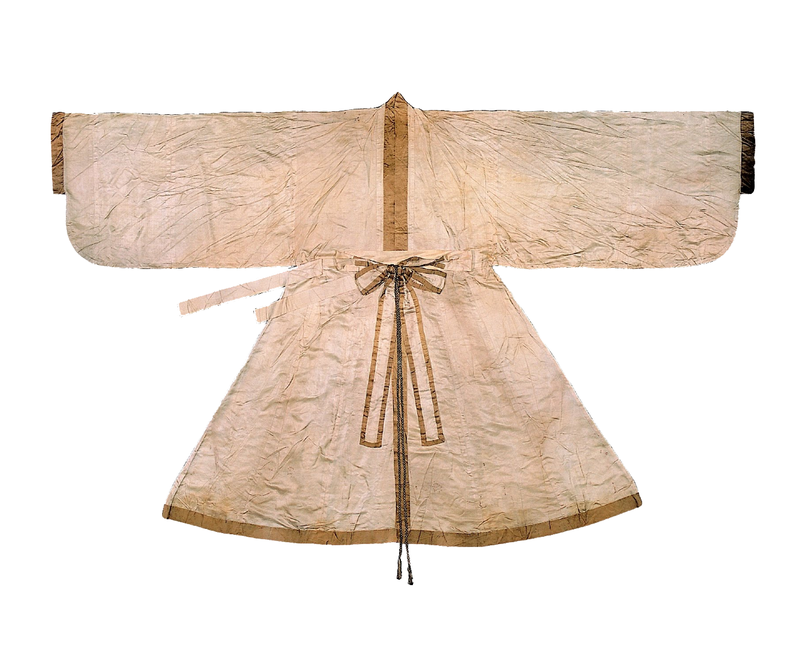 This single layered Shimui, made of satin, is the first outfit out of the clothing that the dead wore as a cerements. The skirt of the coat is constructed with twelve panels and this symbolize the 12 months of a year. And the connected structure of the skirt part and the top part symbolized the connection between the sky and the earth. The half width of sleeve is same as the length of the waist-up. Double layered breast ties were sewn in between the bodice and the skirt in the front. The front opening, hem, cuffs and the fabric belt is trimmed with black tapes. The waist is wrapped around with a fabric belt and tied in a knot. Then a braided narrow belt is hooked on the top and hung down parallel. Although the color of a belt is faded, it suggest that many color threads were used to braid the belt. Hakchangui is an everyday clothes for a senior scholar or a nobleman. 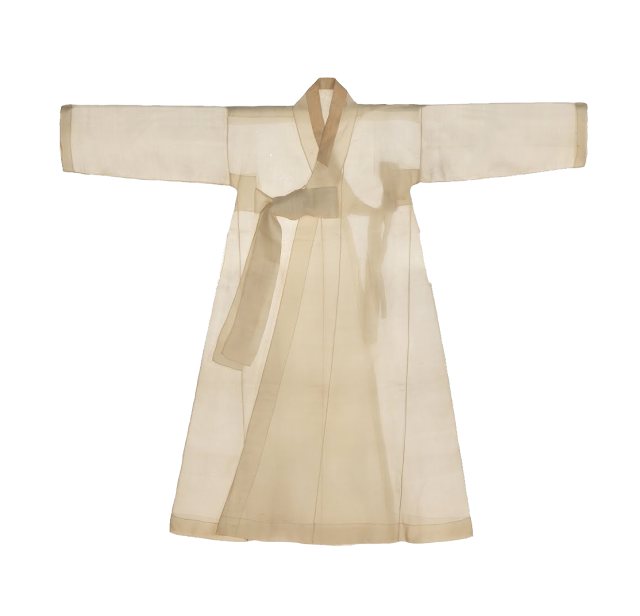 This single layered coat is made of white Soonin (silk, simple gauze). The collar, hem, front opening, slit and the cuffs are trimmed with black Soonin as well. The sleeve is wide. 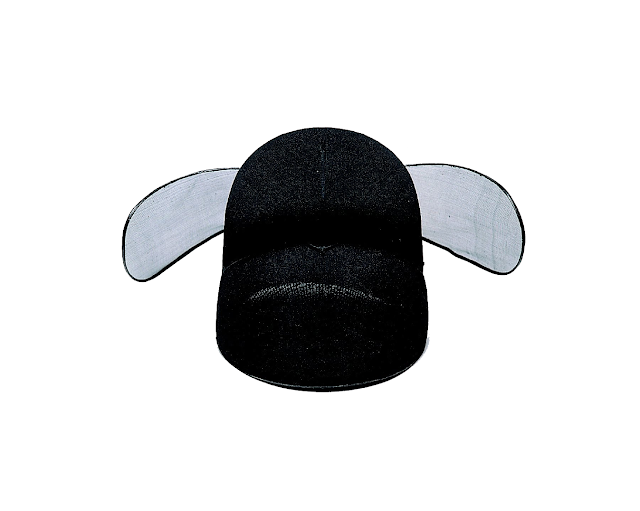 The black seams have slits up to the same level of underarm, and the side seams have slits in half. 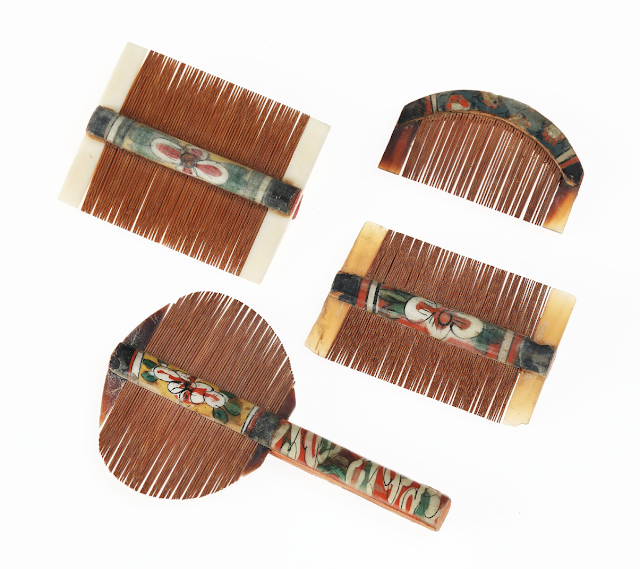 This Durumagi is made of Sampalju (fine silk tabby), and lined with silk tabby. It is layered with cotton batting for the elderly of upper class for the winter season. This kind of padded coat, the most extravagant outfit for the seniors of 1900s, began to disappear by the time that foreign fabrics were introduced. 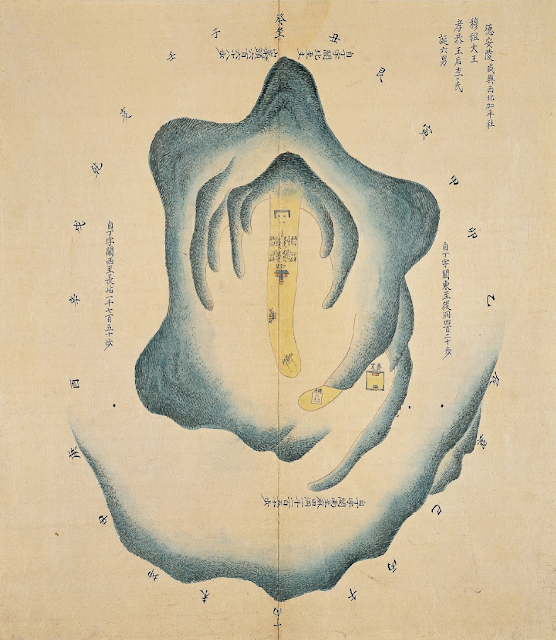 A map of a mountain produced in 1718 when selecting a burial place for Lady Choi, a birthmother of Yeongjo and a concubine of Sukjong. Soryeongwon area which is now situated in Yeongjangli, Gwangtanmyeon, Paju city in Gyeonggi province, was selected as a candidate for the burial place and the picture was painted to show that it was a good place. 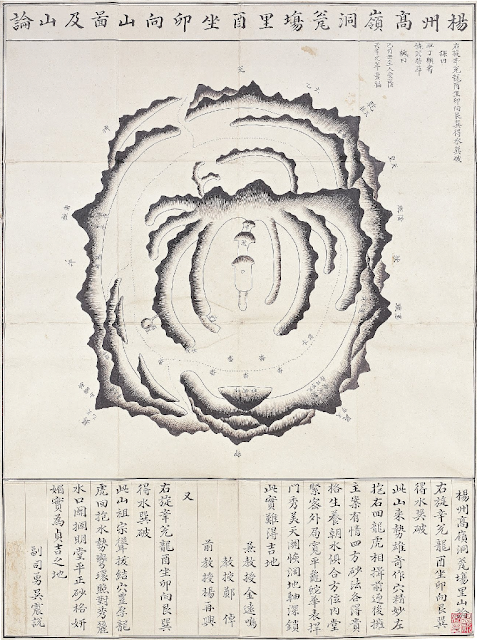 Whenever there was a funeral of the king or the queen, the royal palace would send an official who was good at Chinese geology to look for the good place for the burial. When he was reporting back to the king, he produced such map and writing. Sanron was a written description about the geological factors of certain place. Yeoning-gun (Yeongjo)’s stamp is sealed. 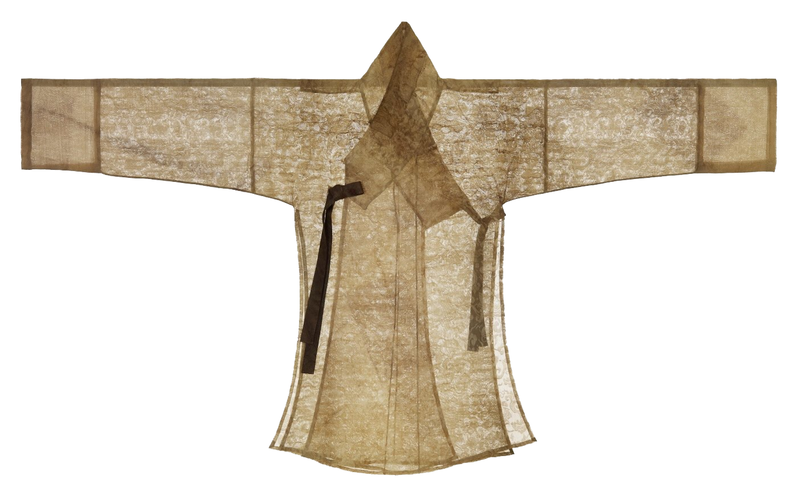 Salchang-gojaengee means a 'window pane pants', as Sal means a pane, Chang means a window. 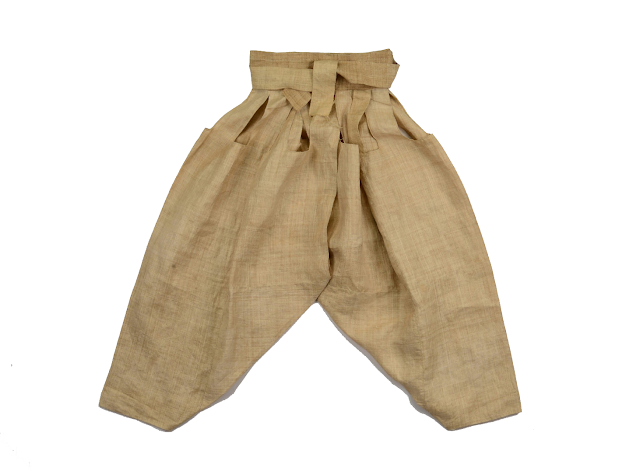 It is an underpants made of hemp clothe worn by women in souther region, where is very hot and humid in summer. This one has eight openings on each crotchs for air draft. 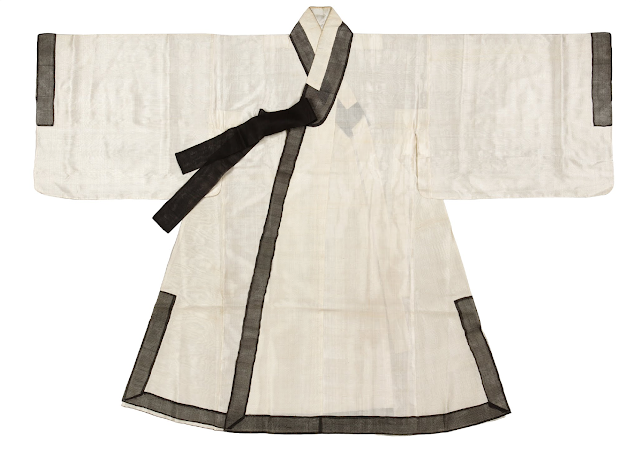 It was originated in Gyeonsang-do region, but generally worn without such reference until 1930s. The Dangui is unlined and made of gauze with a lotus motif. The sleeve is widely cuffed with a white fine tabby, and the collar on the overlapping panel is squared but stands straight upward at the end from the front opening, known as Mokpandangko-git. The outer breast ties are made of dark brown tabby silk, and the inner ties are smaller and lighter in color than the outer ones. 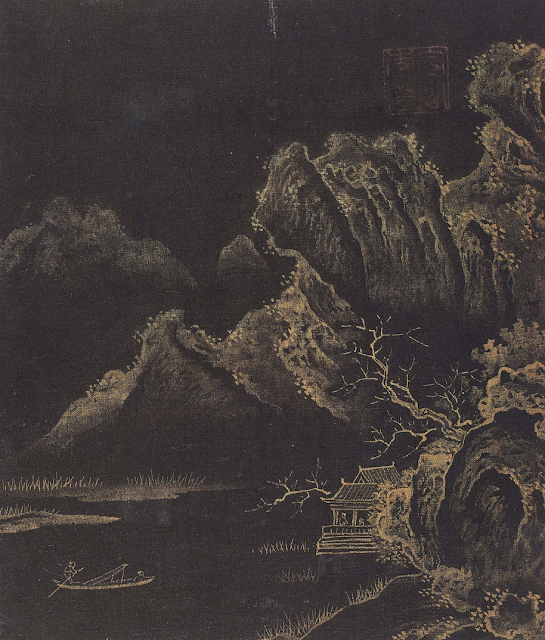 This painting shows Guo Ziyi of the Tang Dynasty, hosting a banquet. Guo Ziyi lived a prosperous life, serving as a high ranking official and saw all of his children succeed as well. In other words, he enjoyed all the fortune one could hope for in a lifetime, and was therefore considered to be the symbol of good fortune. 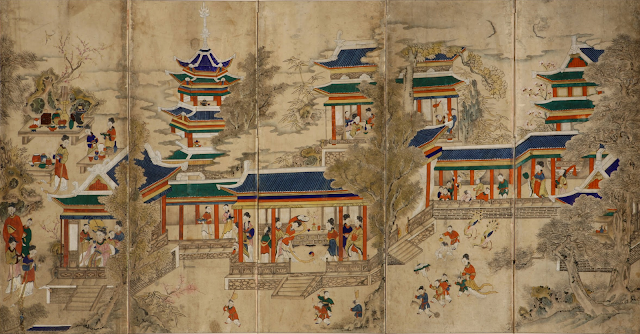 Guo Ziyi's feast was a popular subject matter for folding screen paintings, as it symbolizes good fortune within the household and was also used in weddings. These works of art are all so ethereal and mesmerizing! I adore the Scholars' Coat and Robe!